Pull up a chair. You might just learn something. 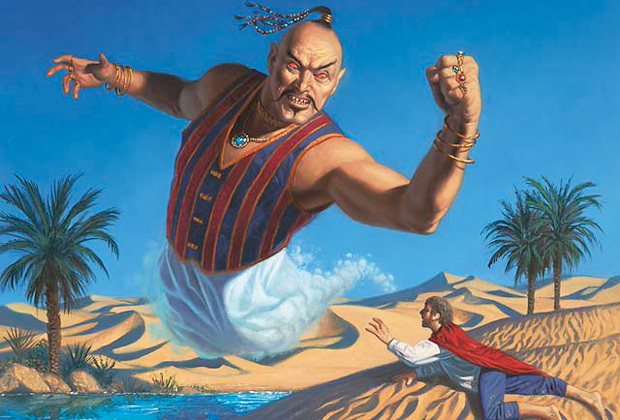 he task of choosing the twenty greatest Magic: The Gathering strategy articles OF ALL TIME is quite simply impossible, even for someone with an exhaustive familiarity with the landmarks, lines in the sand, and legendary lore of the genre—something even I don't have. There are wings of Magic writing, whether for their loose language or (in 2013) suspect subject matter that might have been vital and important once upon a time... but might raise more eyebrows than IQs today. And, certainly, there are more than twenty articles worthy of note, even during 20th Anniversary Week. Anyway, I decided to choose only nineteen strategy articles, and with good reason. The zeroeth one is a doozie. 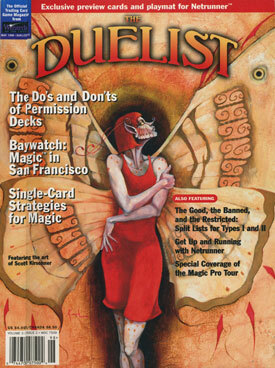 Possibly the greatest Magic article of all time is not aMagic strategy article at all. It's an article about thinking, and how we think about ourselves, but also a band apart for this group. Yet, I felt it would be inappropriate to write about the great works without at least tipping my hat to what is probably the best of the genre as a whole. Mark Rosewater rewrote how we talk about Magic players and put us in boxes even more effectively than Finding the Tinker Deck in this seminal quest for identity. Hi, I'm Mike. And I'm a Spike. You? Probably the most underrated Magic strategy article of all time, "Prerelease Primer" is the rare Magic article that actually changed the world after it hit the digital presses. Certain of us fancy ourselves movers and shakers in this society of specialized scribblers, but for the most part, the best any of us can brag about is a little movement in the metagame. Maybe we spike a tournament or maybe we produce a World Champion. Sure, sure that is impressive... but what about changing the game itself? That, in a sense, is what "Prerelease Primer" did. At the very least it was an early domino in the inevitable progression of Magic's growth. Brian David-Marshall had an idea: What if we equipped players—players who might be interested in attending tournaments but maybe didn't know even the first thing about what to do once they got there—with some basic tools? It seems kind of obvious in hindsight, no? Well, a decade and more later there have been many, many successors to "Prerelease Primer" and with good reason: It turns out that printing this article was highly effective in helping to drive Prerelease attendance for the Legions debut. It's nice to affect the outcome of a tournament; here BDM changed the course of tournaments, and dramatically for the better. Now that we have paid tribute to arguably the two most influential articles ever to grace the wizards.com domain, let us start at the very beginning—a logical place to start. These articles helped lay down the idea of Magic as a serious intellectual endeavor; all four of them were highly influential when they came out and are lasting in their impact,. Rob Hahn did a lot of big, brash things as a Magicplayer, Magic writer, and Magic publisher. He was the first notable Magic writer who didn't actually work at Wizards of the Coast... then went to go work at Wizards of the Coast. He bought The Magic Dojo from Frank Kusumoto and invented the idea of infusingMagic publishing with millions of venture capital dollars. But before he became a columnist at (and editor of) The Duelist, Rob wrote "Schools of Magic." It was like his calling card to everything and everyone that mattered in the niche. Rob was Plato to Brian Weissman's Socrates; he was the mouthpiece of early strategy. It was through Rob that players first learned about card advantage, about exhausting threats from the opponent's deck. Many players intuitively jammed lots of discard spells or land destruction into their decks, but Rob gave them structure; gave them names; taught them how to clock. Schools of Magicmade a spectacular first impression on all of Magicwriting, and remained "the best article of all time" for something like four years—an eternity when there were only, say, five years of the game at all. The first legitimate challenger to Rob's "Schools of Magic" was Frank Kusumoto, who initially fancied himself a sort of historian for decks. Frank was a sponge for deck histories and concepts and an innovator not just in Magic publishing, but website publishing, in an era very different from today. Today, there are thousands or even millions of people aping Kusumoto's curation of information inMagic (we call it "the Internet"). His first punch was Jay Schneider's paradigm-crushing Red Deck, a vital first move not only for his burgeoning website The Magic Dojo but immediately affected the next Pro Tour! My first major Magic strategic concept was also the first of many big ideas I wrote about inspired by—or rather, lifted from—work by friends and associates. I learned about the concept that became "Investment" from the Team CMU guys (notably Andrew Cuneo and Erik Lauer); we already had language around card advantage and card economy in general, but "Investment" helped players think separately about card filtering that replaced itself (like Brainstorm) versus options that didn't (likeMystical Tutor). Both might be effective, but some inappropriate or overrated. Investment is a subtle concept... but one that, by now, you very likely play with intuitively. A not-so-small mistake playing for Top 8 of a PTQ unfurled into a series of falling dominoes that would recategorize all of Magic thought. You have maybe heard of this one? Yeah, even fourteen years later, I suppose it's still pretty good. EDT uses the word "pedantic" in the intro to this article and, while it is probably appropriate, the article is still more than worth a read and quite interesting more a decade after its initial publication. "Tempo and Card Advantage" is influential in a fundamental way, kind of like "Who's the Beatdown?" in that it changed how future writers approached the process of writing and strategy in general. It paved the way for general concepts (i.e., relating the card advantage of a Wrath of God to that of an Ancestral Recall) as well as laying out—explicitly—the two fundamental symmetries of the game. "The Fundamental Turn" has become one of the most important advanced shortcuts for tournament play. Is my deck fast enough to compete in this metagame? Often, all I have to do is look at my deck idea! This kills on turn six? Well you had best be able to win—or at least "win"/not lose—by turn four in this room. Too slow! Move on!... You can thank Zvi. How many times does the opposing control player have to activate a Nephalia Drownyard in Game One before you reach for your sideboard? When two decks go to Pyre Zombies or Hammer of Bogardans, which is favored—the beatdown or the control (contextually)? The answers to either question might be surprising! I have often thought that Zvi's follow-up to "Who's the Beatdown?" was actually the better article. The concept of Inevitability—the idea of which deck in a matchup will win a long game—is extraordinarily powerful. It can inform how you play, which cards you think matter, and which cards you leave in your deck for the next game. Very likely Zvi's masterwork in a library littered with notable articles. The StarCityGames 2006 Article of the Year is still Patrick Chapin's best piece... and that's saying something. Why do large groups of people do dumb things? Like choose bad decks en masse? What decks are metagame frauds? Who should you hire to be your financial consultant? "Information Cascades in Magic" asks tough questions... and dares to answer at least some of them. Just an outstanding Magic article that I revisit over and over, learning new things with every read. This article is so good! Better yet, this article is so cool! Chad Ellis makes a very good faith attempt to teach us Spikes to play like Spikes. It is so easy to fall into cool, fun, crazy, exciting plays... that may or may not help us win more. Who is favored between Junk Reanimator and Junk Aristocrats? For that matter what kind of deck is either Junk Reanimator or Junk Aristocrats? "Finding the Tinker Deck" drew heavily on the example of Schools of Magic but had the benefit of being on an official Wizards site. It simplified big concepts and helped to shape the language we use to talk about decks. Hall of Famer Mike Turian said that Jon Becker's "Tomfidence" is the perfect Magic article. It is personaland actionable, full of useful tidbits and heartwarming name-drops. You want to win your next big tournament? Read "Tomfidence." Perfect. Magic. Article. A Jackal Pup, or Goblin Guide, or even Mogg Fanatic dies... after a hit or two. Brian David-Marshall's voice chuckles on the mic. "Doesn't matter. He did his job." He did his job? What does that mean exactly? If a one-drop gets in for 2—or even 4—points of damage before trading, everything might just be coming up Piznarski for the red mage! 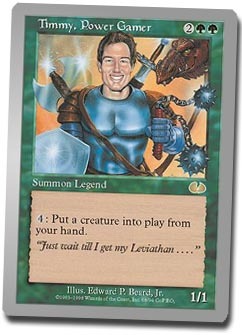 Adrian Sullivan created an inventive connection between card economy and life totals. "The Philosophy of Fire," co-opting Adrian's unifying concept, changes how red players approach their hands, and even their deck strategies. The line "The Philosophy of Fire" can draw in red strategy helps differentiate TheLava Spike Deck from Red Deck Wins. "Today, the story of why I am not afraid of Circle of Protection: Red, Silver Knight, Worship, Pulse of the Fields, or any other stupid White cards." Dan Paskins is like basic Mountain's personal Shakespeare. He is hilarious; unflinching; and, of course, British. Everything he writes is about how triumphant Red Decks make the world go round and... well, there is nothing on the other side of that conjunction. "Who's Afraid of the Big Bad Circle?" is like "Who's the Beatdown II: Multitasking"... A long-named article that introduces an important, pithy, macro concept. Where Zvi gave us Inevitability, Paskins donates The Fear. You'll have to read it all to learn everything Dan knows about The Fear... but you already know he's not afraid of Circle of Protection: Red, Silver Knight, Worship, Pulse of the Fields, or any other stupid White cards. Chapin is playing Extended boogeyman High Tide. Theron Martin successfully Lobotomies the card High Tide. "The Story of Low Tide" describes Patrick's epic quest to win the game without one of the core pieces of his combo deck—its namesake, in fact! How does the future Hall of Famer go about getting the resources necessary to Stroke of Genius his opponents, who already hit the lottery, and is just accumulating more and more resources? Because he does. And it is spectacular. Out-of-the-box thinking and the ability to steal victory from the jaws of defeat at its best. Nick Spagnolo may be history's most underrated Magic theorist. A fine player, deck designer, and (obviously) writer, Nick voluntarily cut himself short by becoming a buyer for StarCityGames. Although this article was printed a decade after "The Story of Low Tide," they are like mirror images of one another: one asks how you win with your combo after the combo has been gutted (you obviously have to do something different)... and Nick talks about playing commonly played cards differently—and much more successfully—than everyone else. At the time "Casting Blue Spells" came out, Preordain was the most successful blue card in Standard (slightly more played, if less heralded, than Jace, the Mind Sculptor). It was in all the decks... and the vast majority of players were playing it wrong! Mistake after undetected mistake! Nick set strategies straight with this one with concrete, sober, and results-backed reasoning. Brian Kibler, two-time Pro Tour Champion, Pro Tour Hall of Famer, heartthrob, Dragonmaster. The name sparks images of Baneslayer Angel dominating smaller Zoo decks or the perfect Primeval Titandraw. Junk mana bases. Naya mana bases. Knight of the Reliquary. There is little doubt that Brian is one of the most popular fixtures in 2013 Magic, and his name is almost synonymous with giant green creatures (or at least mana Elves making giant creatures, green or simply allied with green). But every great story has a beginning, and "Dragons and Deep Dish" is Brian's. Mising the absolute last ratings invite for Pro Tour Chicago 2000, Kibler eschewed Fires of Yavimaya, Ramosian Sergeant, Nether Spirit,andFact or Fiction to obtain his first Pro Tour Top 8... which, incidentally, is the greatest Top 8 of all time. If you cheer for a 2013 Kibler, great. But did you know his first time on the Sunday stage involved smacking fellow Hall of Famer Zvi Mowshowitz with a 6/6 Dragon wearing Unflinching CourageArmadillo Cloak? Yeah, it's about as cool as it sounds. For an article (series) that ends with "forget about the story/just tell me your record," Cunningham tells a hell of a story. Split across multiple parts, "Get Big or Die Trying" is the tournament report masterwork of arguably Magic's greatest stylist. The struggle to escape mediocrity. Rooming with yo momma to defray travel costs. Playing in the Invitational—the culmination of a career of Magicaspiration—and repeated tidbits, Easter Eggs, and conversations with Magic luminaries... "Get Big or Die Trying" has everything. It certainly is "big". For my money, Paul Rietzl's victorious PT winner report is the finest tournament report... maybe ever. And for TCGPlayer's money? Rumor has it this was the most expensive single Magic article ever commissioned by a website. But you know what? When you turn out work like Paul did in this one? It must have been worth it. "A Champion Returns" is the classic hero's journey from low to triumph. It has everything... preparation, strategy, even mental game. For someone on top of the world, Rietzl does an amazing job approaching the tournament report with utter poise and humility. The perfect capstone to today's cherished twenty. As I said at the top... picking just twenty isn't easy. Did I miss your favorite? You might share it in the comments. Happy anniversary, Magic. Here's to twenty more!